1. Unlike steam hammers or air hammers fed from a supplementary compressor, the Pneumatic forging hammer with its self-contained cylinder,require no ancillary power raising plant. 2. The Pneumatic forging hammer is equipped with a self-priming lubricating oil pump, during operating, it can realize the automatic lubrication. 3. Easy to operate, by manipulating the hand lever or foot-pedal, all operating functions—idle run, top setting, pressing down, single blow, light or full series blow can be obtained as desired. Anyang pneumatic forging hammer capacity from 150kg to 2000kg are widely used in the industrial open die forging. 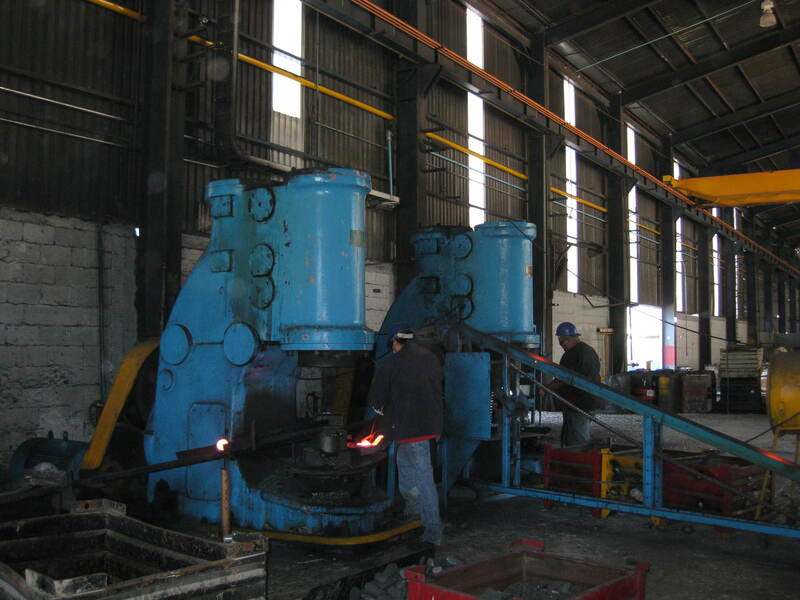 can do drawing-out, upsetting, punching, chiseling, forging welding, bending and twisting etc forging process. 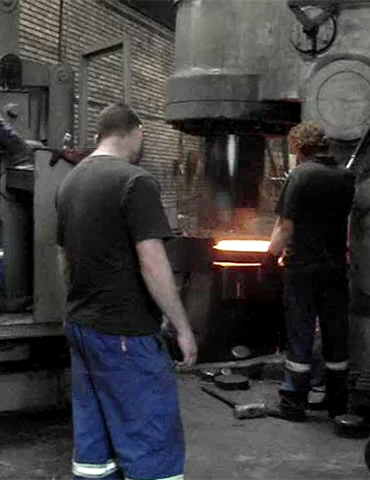 It is also used for forging in bolster dies. 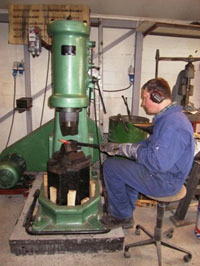 Anyang hammers are self contained pneumatic power hammers. The design is based on old European pneumaitc hammers design. With a self contained power hammer, don't need external air supply or high pressure hoses. You can switch heavy forging to thin light forge immediately by controlling padel. The self contained hammer with tremendous forging power (a combination of ram weight, downward air force and velocity) plus precise control. 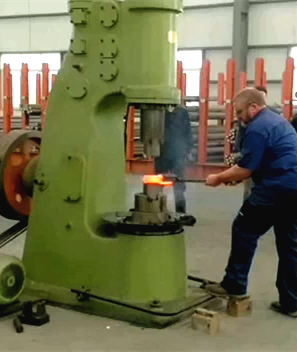 ​Anyang hammers are designed to run for decades in harsh factory environments. The frames are cast iron, like the old Nazel, Bache and Massey hammers. Cast iron is more expensive to manufacture compared to fabricated hammers but they are heavier, do not flex over time. ​The internal parts are forged steel and precision machined. There are no internal rubber air hoses to deteriorate over time. The drive belts are external to the machine for easy adjustment and away from harmful oil. ​The crankshaft has large tapered roller bearings set in a case filled with grease. This design provides for decades of trouble free forging. Anyang pneumatic forging hammer do not need out-side air compressor. will compress air inside with motor driven flywheel. The cast Iron Frame will never flex or warp. Compare the weights of different hammers available and you will find that the Anyang is amongst the heaviest. Cast iron is much more expensive to manufacture but allows the designer to put the mass and strength where it is required. Lifetime frame warranty , five year on wearing parts against defects, one year on electrical components against defects. External drive belts. Design keeps the belts dry and away from oil. This eliminates belt slippage and extends belt life. Replacing the belts is quick and easy. The air ports are cast into the hammer. This eliminates internal rubber hoses and fittings. Low maintenance. Anyang power hammer Automatic and fully adjustable oil system. The two grease zerks are easy to reach. Large tapered roller bearings in crank case for long trouble free life. Simplistic design. Only 3 basic sections (crank case, compressor piston, ram). Hammers can be disassembled, and if needed rebuilt in a day or less. Very controllable, making the use of tooling easy. The operator can change tooling or material thicknesses without adjusting the ram or stroke. Easy to install- once the hammer is uncrated installation takes about 30-45 minutes. Blacksmith power hammer ( C41-9, C41-15,C41-25,C41-40,C41-55,C41-75,C41-110 ) has SINGLE FRAME and good for forging work handling. Anyang power hammer good for making work handling tools for forging operation, forged hunting knives, scissors, general operational tools, farm implements and iron art parts for house gate & fence. All anyang power hammers have got CE. The design is safty. 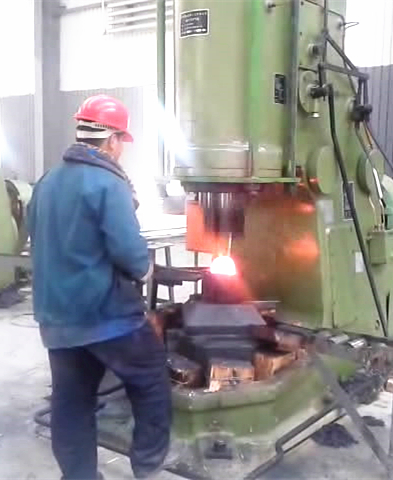 Besides above advantags of Anyang power hammer, the new design L type hammer have a big step improvement. In the new Anyang L type series power hammer, the die does not retract into the cylinder. It is much easier to change dies and make top/bottom die tooling without expensive machining. Can install extra tools on the hammer die to make your work easier. One key can fit all dies. The throat is deeper allow big piece forging. PS: L type power hammer the tup die will not retract in to the cylinder, and the throat depth is deeper.Anyang L type power hammer is patented product, no infringement allowed.